The University of Surrey is a university located within the county town of Guildford, Surrey in the South East of England. It received its charter on 9 September 1966, and was previously situated near Battersea Park in south-west London. The institution was known as Battersea College of Technology before gaining university status. Its roots however go back to the Battersea Polytechnic Institute, founded in 1891 to provide further and higher education for London's poorer inhabitants. The university is a member of the 1994 Group.The university conducts extensive research on small satellites and has a high number of staff who are members of learned societies. The most recent Research Assessment Exercise awarded nine departments at the university 5 or 5* ratings.The university has recently expanded into China by launching the Surrey International Institute with Dongbei University of Finance and Economics. The University of Surrey was preceded by the Battersea Polytechnic Institute which was founded in 1891 and admitted its first students in 1894. Its aims were to provide greater access to further and higher education for some of the "poorer inhabitants" of London. The Institute focused on science and technology subjects, and from about 1920 taught some classes for University of London students. In 1956 the Institute was among the first to receive the designation "College of Advanced Technology" and was renamed Battersea College of Technology. By the beginning of the sixties the College had virtually outgrown its building in Battersea and had decided to move to Guildford. In addition to this, the Robbins Report of 1963 proposed that the Colleges of Advanced Technology, including Battersea, should expand and become degree-awarding Universities. In 1965 the university-designate acquired a greenfield site in Guildford from Guildford Cathedral, Guildford Borough Council and the Onslow Village Trust. 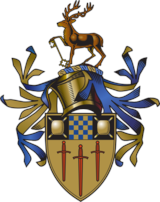 The following year, on 9 September 1966 the University of Surrey was established by Royal Charter and by 1970 the move from Battersea to Guildford was complete. Early visitors to the new campus were Led Zeppelin, who performed their very first gig at the university on 15 October 1968. In 1982 the university became the trustee of the building of the Guildford Institute and uses parts of the building for its adult education programme which ensures a university presence in the heart of Guildford. The Assessment and Qualifications Alliance (formerly Associated Examining Board) moved from Aldershot to its own headquarters building on the Stag Hill campus in 1985. The university marked its Silver Jubilee in 1991, an event celebrated by the publishing of Surrey - The Rise of a Modern University by Roy Douglas and by a Service of Thanksgiving in Guildford Cathedral attended by Her Majesty The Queen in March 1992. The university celebrated its 35th anniversary year in May 2002 with a major event in Guildford Cathedral. It was also marked by the unveiling of the Surrey Scholar sculpture (by Allan Sly FBS) to mark the Golden Jubilee of Her Majesty The Queen and as a gift to the people of Guildford. The Surrey Scholar is located at the bottom of Guildford High Street. Understanding the Real World, a visual history of the university, by Christopher Pick, was published to coincide with this anniversary. On 1 July 2005, Prof. Christopher Snowden became Surrey’s fourth Vice-Chancellor and Chief Executive. Like his predecessors Prof. Dowling and Prof. Kelly, Prof. Snowden is a fellow of the Royal Society. He was appointed in recognition of his pioneering work in the fields of microwave engineering and compound semiconductors. In 2007 the university saw a major increase in overall applications by 39% compared with the previous year.This was followed by a further increase in applications of 12% in 2008. In October 2008, the university lost out to Royal Holloway in a bid to merge with London medical institute St George's, University of London. From September 2009, the Guildford School of Acting will become a subsidiary of the university and relocate from Guildford town centre to the university campus.